Like many in my generation, I grew up with a copy of Josh McDowell's Evidence that Demands a Verdict (henceforth, Evidence) on the bookshelf. Over the years, I frequently consulted Evidence to quell doubts and provide ammunition to fire back at the skeptics on topics like evolution and the authorship of Daniel. Apparently, a lot of people had Evidence on their shelf because the original 1972 edition was revised in 1979 and again in 1999 (xvii). 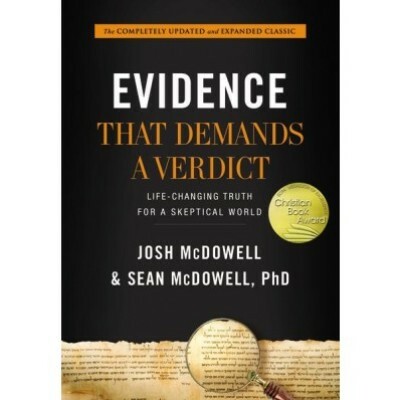 Now that we have a third extensive revision, one that adds Josh McDowell's son Sean as a coauthor, I thought it time to return to Evidence for a closer look at the latest edition. Henceforth in this review, I will refer to McDowell and McDowell as M&M. I have titled this review "Fundamentalist Apologetics Comes of Age". That title reflects two facts. First, Evidence has indeed come of age in the sense that it reflects an advanced state of development: this is a massive book (798 pages plus a 74-page introduction) and it covers a dizzying array of topics in an accessible and engaging manner. For that, it should be lauded. That said, the reader should also be aware that Evidence continues to exhibit the characteristics of Protestant fundamentalism. For some people, that may be a boon to be celebrated. But for others, it is an unfortunate fact, one that significantly qualifies the book's otherwise laudable achievements. Let's start with the positives. As an apologetic work approaching nine hundred pages, it should be no surprise that Evidence covers an enormous range of material. Following an extensive seventy-page introduction, the main text includes four parts: Part I: Evidence for the Bible; Part II: Evidence for Jesus; Part III: Evidence for the Old Testament; Part IV: Evidence for Truth. But before launching into some plaudits, I must say that I find this structure deeply idiosyncratic. To begin with, the introduction includes not only a personal testimony and an introduction to the field of apologetics, but also a section defending the existence of God. On the contrary, I would think a defense of the existence of God (i.e. theistic apologetics) properly belongs as the first major section of the text proper. After all, a defense of God's existence is not prolegomenal to Christian apologetics: rather, it is a critical part of the apologist's work. Meanwhile, Part IV includes foundational material on topics such as the nature of truth and the concept of knowledge which arguably do belong in the prolegomena of the introduction: after all, every subsequent argument depends on a concept of truth and the accessibility of rational belief and knowledge. I also find the text's treatment of key biblical issues as idiosyncratic, but since those further points are indicative of the fundamentalist biblicism of the text I will return to discuss them below. But now it's back to the good news. And let me begin with the fact that the book is, for the most part, very readable. This is a feat in itself because Evidence has always been distinguished by a large number of extended quotations from other sources. In my experience with earlier editions of the book, that rendered the text better suited as a reference work for various topics rather than a unified book that one might read straight through. But that was not my experience with this latest edition. Indeed, at times I found this latest edition of Evidence to rise to the level of a bonafide page-turner. Hats off to M&M for that! One of the great attractions of the book is that it boasts an encyclopedic breadth of various apologetic topics and persons. For example, it includes an excellent survey of the biblical manuscript evidence, succinct rebuttals to leading skeptics like Richard Carrier (280-84) and Bart Ehrman (Appendix), and concise summaries of controversies both recent (e.g. the Talpiot Tomb: 293-300) and old (the mystery religions). While we're on the topic of mystery religions, I especially appreciated M&M's treatment of this old canard. According to this old objection, core Christian claims of Christ's death and resurrection are anticipated in so-called mystery religions of dying and rising gods. Hence, Christianity is best explained as a further development of these venerable legendary motifs. In reply, M&M first point out that evidence for the mystery religions is all second-century and thus after Christ. As a result, if there is influence here, it flows from Christian belief and practice to that of the mystery religions. Further, even if the mystery religions did precede Christ, that hardly shows they explain Christ's death and resurrection. To make the point, M&M give an analogy. In 1898 a novel was published about a passenger ship called the Titan which sinks in the Atlantic. The novel famously bears several uncanny parallels with the later sinking of the Titanic. But nobody would think that provides a reason to question the historicity of the latter event (311). Finally, M&M cite Tolkien's argument that anticipations of death and resurrection could be interpreted by the Christian in terms of general revelation as "God ... using the images of their 'mythopoeia' [story-making] to express fragments of his eternal truth." (314) Indeed! And so, in a few pages, they offer a succinct and satisfying rebuttal to a bad (but persistent) argument against Christianity. This mystery religions example illustrates the strength of Evidence: generally brief, clear, and reliable summaries of various arguments and responses to various objections (exceptions will be noted below, however). Among the many other topics treated we find a helpful summary of cosmic fine-tuning (lxvi-lxx), a quick refutation of the miracles of Apollonius (350-1), a survey of first-principles that one can know by rational intuition (626-30), and a summary of the Moorean shift as a fitting rebuttal to skepticism (659-60). And of course, that is but a brief sampling of the extensive list of topics addressed. And here's the really amazing thing. This eight-hundred-page encyclopedic survey of apologetic topics is currently a mere $20 for hardback at Amazon.com. Even more incredibly, as I write, the Kindle version is $2.42. In other words, you can have all this on your smartphone for less than a Starbucks latte! With that in mind, I don't mind saying that despite the significant caveats that I will summarize below, Evidence is surely one of the biggest bargains in Christendom. Everything that I've said thus far is sufficient reason for you to buy the book, period. While Evidence is most surely worth the purchase price (and then some), it is important that the reader understand the book reflects some common Protestant fundamentalist hallmarks and thus, in that sense, can be properly deemed a fundamentalist apologetic. Too often, the word "fundamentalist" is tossed around with no definition. (As Alvin Plantinga once wryly observed, people who apply the label to others often mean nothing more than "more conservative than me.") But fundamentalism should not be treated as a mere insult. When I use the term, I intend to signal a position that evinces a particular set of characteristics commonly associated with the Protestant fundamentalism that arose a century ago and which has remained a significant force among North American Protestants for the last several decades. These characteristics include biblicism, biblical literalism, rationalism, triumphalism, and binary oppositionalism. This is an important statement since it makes clear that the intent of Evidence is not simply to summarize some particular beliefs about the Bible; rather, the purpose of the book is to present and defend the entire Christian faith and to do so in a sprawling work of close to nine-hundred pages. With that in mind, we face a puzzle. You see, while the book is purportedly concerned with defending the entirety of Christian faith, it has an inordinate focus (70% or 600+ pages) devoted to explicating and defending the Bible. While some of these points — e.g. the historicity of Jesus and his resurrection — are certainly core to Christian belief, others are not. Consider, for example, the fact that entire chapters are devoted to relatively arcane topics like the authorship of Isaiah and Daniel. Not only is the book largely devoted to the Bible, but incredibly enough, the authors devote fewer than five pages to discussing the most central doctrines of Trinity, incarnation, and atonement. Now this is a puzzle: why hundreds of pages on the Bible but almost nothing on essential Christian doctrines? The answer, so I believe, is found in the influence of biblicism. I understand biblicism to represent a view that eschews the critical role of communal tradition in articulating Christian faith in favor of a belief that the Bible alone remains the source and norm of theological belief and Christian life. The biblicist tends to downplay the post-biblical development of doctrine within the church as well as the extent to which extra-biblical sources (e.g. reason, tradition, experience, community, culture) played in the articulation of doctrine. On the contrary, the biblicist tends to understand the core doctrines that define Christian identity as existing in latent form in the Bible. And thus, the relevant verses only need to be identified and their implications unpacked in order to have a sufficient definition of various Christian doctrines. This biblicist mindset is famously illustrated in the methodology of Gordon Lewis, Decide for Yourself: A Theological Workbook. And so, for example, in order to articulate the doctrine of the Trinity one can bypass the history of doctrinal debate and creedal development and instead focus simply on the exegesis of a narrow set of biblical texts. If you can defend the Bible (and the chapters on Isaiah and Daniel are devoted to defending the traditional authorship so as to retain the veridical force of their future-prophecies) then all the rest, including major Christian doctrines unfolds naturally. As M&M write, the doctrine of the Trinity is "Rooted deeply in the pages of Scripture" (7). But the reality is far more complicated. Christian doctrines are not simply read out of the Bible. Nor are they derived from the Bible by some theological analogue to Baconian induction. Rather, they are theoretical interpretations of scriptural data that unfolded over centuries as the church wrestled with the biblical text and their own communal and individual experience in light of the best philosophy and culture of their day. Perhaps Evidence might be forgiven for failing to exposit major Christian doctrines: after all, it is an apologetic book, not a work of theology. But then, the book also omits any apologetic defense of major Christian doctrines despite the fact that each of them is subject to significant objections. For example, critics have argued that the doctrines of the Trinity and incarnation are incoherent; they've insisted that atonement is immoral; they've claimed that divine foreknowledge is inconsistent with human free will; they've warned that an eternity in heaven would be insufferably boring and an eternity in hell inexplicably cruel. These and countless other objections have been offered to specific Christian doctrinal claims, and yet Evidence, an eight-hundred-page book ostensibly devoted to defending "the claims of the Christian faith", discusses none of them even as it devotes entire chapters to the authorship of Isaiah and Daniel! The second theme that I want to highlight is biblical literalism. This is is a distinctive hallmark of fundamentalism according to which the default interpretation of a biblical text is a literal interpretation. And what exactly is the literal interpretation? The concept is commonly associated with a plain or straightforward reading of the text. I understand why a modern reader would assume that particular readings of the biblical text are obvious or plain or straightforward and thus how any interpretation which deviates from this obvious, plain, straightforward reading is automatically suspect. However, too often the fundamentalist assumes that plain and straightforward to the ancient Israelite or first century Christian is just the same thing as plain and straightforward to the twenty-first century North American fundamentalist. And who decides what is straightforward? Is six 24 hour days the straightforward reading of Genesis 1? What about a literal thousand year millennium in Revelation 20? Chapter 17 and its discussion of the historical Adam is particularly illuminating. The chapter is deeply influenced by the Zondervan book Four Views on the Historical Adam which features a debate between a young earth creationist, an old earth creationist, and two theistic evolutionists (John Walton and Denis Lamoureux). To their credit, M&M engage with Walton and Lamoureux. Nonetheless, their engagement struck me as superficial and perfunctory, a necessary stop on their way to affirming old earth creationism. To sum up, M&M could have done their readers an enormous service by equipping them with a sophisticated and nuanced concept of divine accommodation rather than retaining the awkward concordism that so often characterizes fundamentalist approaches to the Bible and science. The word "rationalism" can mean many things. Here I am using it to flag two themes in Evidence: a commitment to biblical propositionalism and biblical inerrancy. Propositionalism reflects the idea that the essence of biblical revelation is found in the communication of propositions, in other words, statements about God and our relationship to him. In short, for the propositionalist, the Bible is primarily an information transfer rather than an experiential, transformative text. This notion of Scripture as a mere repository of facts was famously defended by Carl Henry, but to non-fundamentalists it reflects a gross reductionism. Scripture is, first of all, a transformative encounter and the reading of and submission to it should not simply convey facts but yield transformation (2 Timothy 3:16-17). Hence, we have Karl Barth's famous invitation to the strange new world in the Bible. The inerrantist may be able to reconcile the two seemingly contradictory accounts of the death of Judas (70), but how do they propose to reconcile Ezekiel 18:23 with Psalm 37:13? No doubt, they will try. But what if this entire approach to the Bible misses the point (Gen. 32:28)? I do want to give M&M some credit here as early on they have a good discussion on the importance of character and conduct (liv-lvii). So even if they are triumphalistic, they're not going to rub it in! At the same time, as I read through Evidence I found that M&M often overplayed their hand. For example, at several points, they move from mere possibility to plausibility (see, for example, their discussion of the virgin birth). At the same time, they completely skirt some of the most troubling objections to the Bible (e.g. biblical violence) and Christian faith more generally (see my comments above on Christian doctrine). Particularly revealing is their discussion of prophecy in chapter 9: "Old Testament Prophecies Fulfilled in Jesus Christ." Fundamentalist apologists have a very bad history of naively prooftexting biblical prophecies to establish allegedly rationally compelling evidence for the supernatural origins of the Bible. Initially, it seems that M&M are going to avoid these perils as they acknowledge the literary/typological function of prophecy (e.g. 211). In other words, the cautionary hermeneutical lessons from earlier in the chapter are suddenly forgotten as we fall back into the worst of fundamentalist bad Bible reading and misbegotten triumphalism. I don't disagree with this caveat: scholars can have biases. The problem is that M&M repeatedly warn about the biases of so-called liberals. As they say, "the anti-Bible bias is so strong in current academia...." (419) However, it is clear that for M&M "anti-Bible" reduces to opposition to their fundamentalist and inerrantist reading of the Bible. The irony is that if there is evident bias here, it is most surely with M&M and their fellow conservative (i.e. evangelical and fundamentalist) scholars. Note that M&M frequently endorse highly idiosyncratic positions because of their theological conservatism including Mosaic authorship of the Pentateuch (5), Isaian authorship of Isaiah (chapter 24), and Pauline authorship of Hebrews (32; but see 183). Not surprisingly, they offer no caution to the reader to look for the biases that underlie their own approach to the data. Instead, we are only given warnings to be suspicious of the majority opinions of "liberal" scholars. This tendency of M&M to impugn bias and nefarious motives to non-conservatives is an example of poisoning the well. Perhaps the ugliest expression of the practice occurs when M&M attempt to tar the Documentary Hypothesis with the brush of anti-Semitism (540). To be sure, anti-Semitism is an ugly thing but whether or not Wellhausen was anti-Semitic has precisely no bearing on assessing the veracity of the Documentary Hypothesis. At the end of the book, M&M devote chapters to discussing postmodernism and skepticism. However, rather than explore how one might critically engage these ideas with charity and nuance (e.g. by considering how the postmodern incredulity toward metanarratives may illumine a Christian epistemic humility), they feel compelled to offer unqualified rebuttals. And so we get confrontational chapter titles: "Answering Postmodernism" (645) and "Answering Skepticism" (662). This is absurd. As Anthony Kenny once observed, reason itself is the golden mean between skepticism (i.e. the tendency to doubt) and credulity (i.e. the tendency to believe). And the same goes for discernment. It is no substitute for skepticism. Rather, it is an expression of reason which includes skepticism. So why do M&M demonize skepticism in all its expressions? I suspect this reflects a tendency to retrench belief within the conservative Christian community. Alas, this kind of binary oppositionalism sustains conformity of belief at the cost of critical thinking. Not every vestige of fundamentalism evident in the book can be explicated as a running them. At several points, M&M evince other common characteristics of fundamentalism. For example, in their efforts to strengthen their position, fundamentalists frequently caricature or otherwise misrepresent the beliefs of others. As a case in point, consider M&M's claim that according to Judaism, people are saved by "the Law" (xlv). That's it: the sole reason for rejecting Second Esdras. This is a bald case of special pleading. If we are to reject Second Esdras because Martin Luther found it confusing, then why keep Revelation? Next up, we have the fundamentalist commitment to tract-based conversionist evangelism: believe it or not, the final four pages of Evidence (795-98) are devoted to a summary of Bill Bright's Four Spiritual Laws. Finally, fundamentalists tend to be complementarians and to employ patriarchal and gender-exclusive language. With that in mind, note that M&M employ "man" and "mankind" throughout the text (e.g. 10; 199; 224; 384; 387; 425; 428; 429; 430, etc.). This might seem like a small matter to the lay reader. But within the academy, the use of gender-inclusive language (e.g. humankind; humanity) has been de rigueur for more than twenty years. Set against that backdrop, the persistent use of widely rejected gender-exclusive language is insensitive at best and an affront to gender-inclusion at worst. As I observed above, not everybody is opposed to fundamentalism. To those folks, I can recommend this book without qualification, at least in the sense that I think they will find it to be beneficial without qualification. But I don't share that rosy picture of fundamentalism. I think its distinguishing features like biblicism, literalism, rationalism, triumphalism, and binary oppositionalism are false and harmful. And in that sense, my own commendation of Evidence most surely comes with a qualification. Nonetheless, the virtues of the book — clear writing; encyclopedic scope; bargain price — are undeniable and that is sufficient for me to give Evidence a robust, if qualified, endorsement. You can visit Amazon for those bargain prices here. And my thanks to Thomas Nelson for a review copy of Evidence that Demands a Verdict.